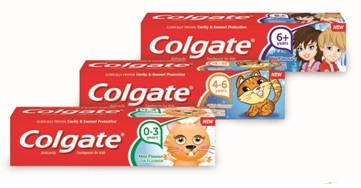 When I found out Colgate had created a new Kids toothpaste range I was really excited. Yes.. I did just say I was excited about toothpaste and you should be too. Colgate is a brand that we have used for years as a family and one that I trust. Teeth are so important and I believe that it is very important to teach children to look after their teeth from a young age. Maxx has always been good with brushing his teeth and has never made a fuss. Now he is 4 and becoming more independent, he is wanting to brush his own teeth which is great as he is starting to understand how important it is to look after his teeth. He isn’t capable of cleaning his teeth properly himself so we clean his teeth for the recommended 2 minutes then he practices brushing them afterwards. I have noticed a lot of children’s toothpastes are bubblegum flavoured. It might just be me but I think that a toothpaste should be mint flavoured and don’t agree with trying to tempt children with sweet flavours. Maxx was really excited when he found out he had some new toothpaste to try. When we used the toothpaste he said it tasted nice and wasn’t too spicy as he calls it! His teeth were left lovely and clean and he had lovely minty breath which he thought was funny and made a point of breathing on everyone for the next 5 minutes! The toothpaste was a big hit with Maxx and we will be continuing to use it until he needs to move on the the 6+ toothpaste. The Colgate Kids Range features playful new characters, low fluoride levels and fabulous mild minty flavours that children will love. There are three different toothpastes which are designed for children of different ages and stages, the toothpaste provides clinically proven cavity and enamel protection for all. You can keep up to date with the latest Colgate news and products by Following Colgate on Twitter and Colgate on Facebook. Not just you! I agree ice cream or bubblegum flavour is wrong. It’s like saying ok to sweets. I don’t object to orange,strawberry or proper fruit though. That’s my thoughts too. I think fruit flavoured is okay too but I draw the line at bubblegum! This looks really good, I will have to buy some to try. My daughter doesn’t like spicy either lol.